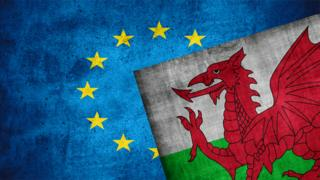 Some parts of the Welsh public sector have only made limited plans for a potential no-deal Brexit, a public spending watchdog has warned. Risks highlighted by public bodies include the disruption of food supplies to hospitals, schools and care homes. The WAO said uncertainty was not an excuse for inaction. Brexit is due to take place in five weeks. The UK government has recognised that there may be disruption to the supply of some fresh food from the continent if a no-deal Brexit leads to delays at ports and airports. In a report, the WAO watchdog said many public sector bodies "are struggling to find the dedicated capacity" to plan for Brexit. For example, the Welsh Government has created 198 new posts to work on Brexit, but in many cases those roles have been filled by existing staff. However, the WAO said the public sector was taking no-deal Brexit planning "seriously" with preparations having ramped up "significantly" since last summer. Most public bodies think potential workforce issues relating to EU nationals are more "medium to long-term" rather than there being a risk of staff suddenly leaving immediately. The auditor general Adrian Crompton said it was not possible to fully reduce the potential impact of a no-deal Brexit. He added: "So, necessarily members of the public, parts of industry and wider society will notice an effect if we leave the EU without a deal. "But I can give assurance that the public sector in Wales is heavily focussed on preparing for that eventuality and for managing the implications as best they can. "Inevitably I think in some parts of the public sector there has been some reticence to commit resources when uncertainty still existed." The report is a "high-level overview" of the no-deal Brexit plans rather than an in-depth examination of the "quality and effectiveness of those arrangements". All of the public sector bodies in Wales, including health boards, councils and fire authorities, contributed to the WAO's report.